JetSeal is a durable paint sealant that protects against the harshest elements. 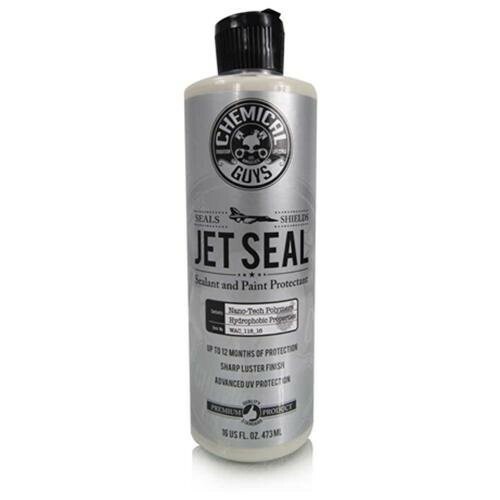 Chemical Guys developed JetSeal for the aerospace industry, which demanded strong protection for jet airplanes flying in extreme hot and cold temperatures. The revolutionary nano-polymers in JetSeal bond directly to the fine pores inside paintwork for a durable bond. A coat of JetSeal helps repel pollution and contamination, enhance a brilliant shine, and preserve a smooth finish. The new extra-durable JetSeal formula protects cars for up to one full year with just one application. The full synthetic formula enhances a brilliant glassy shine that enthusiasts and detailers love for every vehicle color. Traditional natural carnauba waxes are loved for their warm shine and protection capabilities, but they only last a couple months at a time. Extreme weather and temperatures rapidly break down natural waxes, and leave cars unprotected against the elements that dull shine. JetSeal is a manmade synthetic wax that takes paint protection to the next level. JetSeal bonds directly to the surface, creating a strong shield against water spots, contamination, road grime, and UV sunlight. Innovative UV protection technology helps reject harmful solar rays and protect paintwork against fading and discoloration. JetSeal is perfect for any exterior paintwork, glass, clear optical plastics, polished metals, carbon fiber, and any other glossy or clear material. Choose the 21st century standard of durable protection with the brilliant shine of Chemical Guys JetSeal. Squeeze 1 – 3 lines of JetSeal onto a premium foam or microfiber applicator pad and spread over painted panels, glass, polished metals, and clear plastics in a thin, even coat. JetSeal will bond with clean paint surfaces within 15 minutes. Buff off residue with a premium soft microfiber towel. Once removed, allow 20 minutes cure time and apply a second layer to ensure even coverage. Only spread glaze, wax, and sealants like JetSeal with a Dual Action polisher and soft foam finishing pad. Place 4 – 6 dots of JetSeal over foam pad, then spread evenly over paintwork, glass, polished metals, and clear plastics between speed settings 1 and 3. Allow 15 minutes for product to cure, then buff clean with a premium microfiber towel. After advice from the guys at juicy , I was looking to detail my new 308 metallic red. Followed the advice and purchased clay bar kit , bilt hamer polish then jet seal 109. Well worth the time and effort. Have done the same with wifes merc a class looks just like new!! !